Dad came to visit me! 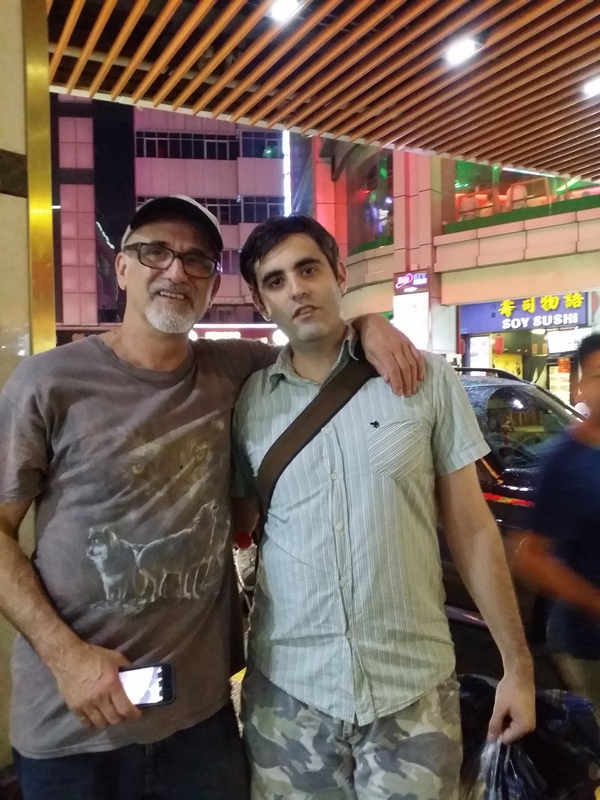 Well, after years of living abroad, I finally got my dear dad to visit China. He has came and went and I survived. A week and a few days, and I hope I was a good host. He came to meet him Hong Kong, and we had the whole airport hug moment. Jetlagged, he was somewhat out of it and I led the way by double-decker bus to Causeway Bay. I know my way around there by now. I didn’t think the journey to the hotel was that bad, and it was merely the first of several arguments. And yet, the biggest challenge was simply that he’s getting older, and didn’t have as much energy as I’d hoped. If it wasn’t one thing it would have been another. “I came here to see you,” he kept saying. Then getting mad at me for dragging him around too much. Hey it’s cool! Also he wasn’t much interested in the food, which makes me wonder what the point is of going to China, but eh to each their own. 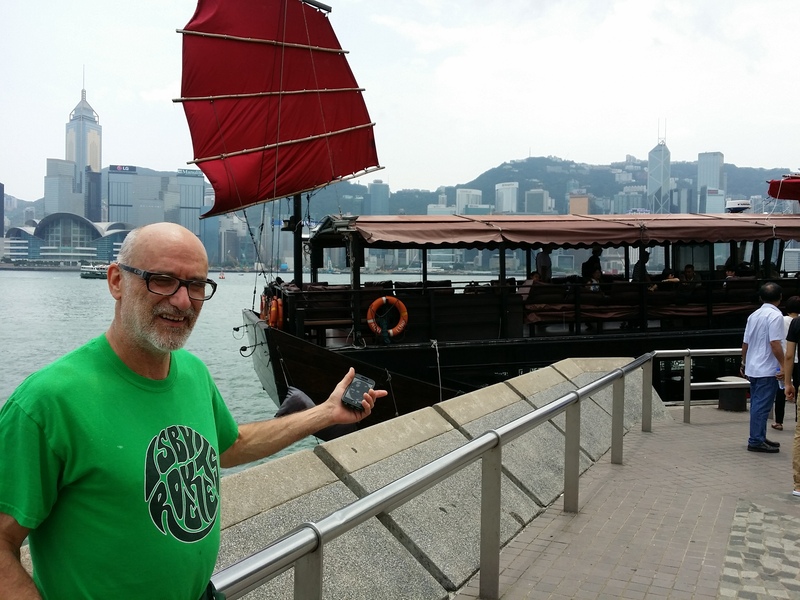 The next day my tour began with a ferry to Kowloon. Ate Indian food at Chungking Mansions, of course, and starting busying souvenirs. Unfortunately, modern China is not quite like what he imagined in the Bruce Lee movies. Not so many rickshaws, but here’s one junk. There would be lots of Bruce Lee-themed wandering. My dad’s number one interest when it comes to China. 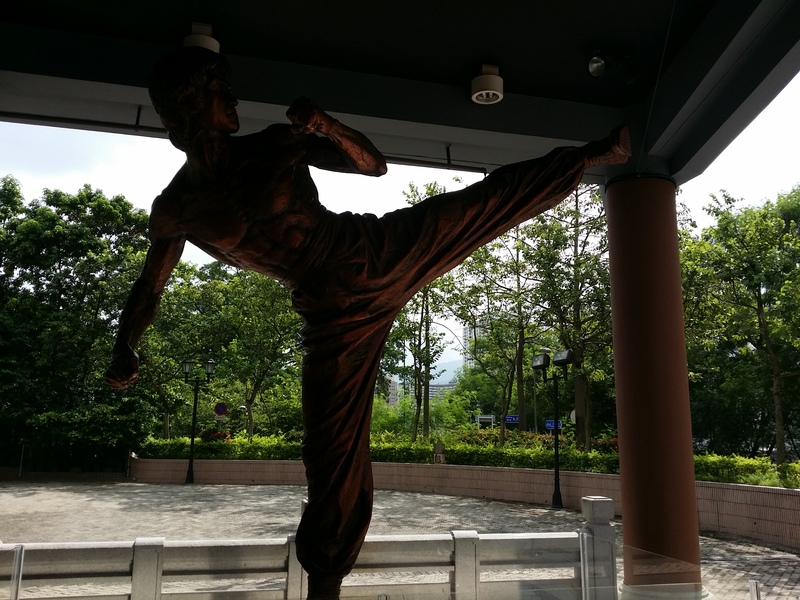 Here’s the Bruce Lee statue from the Avenue of Stars in Tsim Sha Tsui. 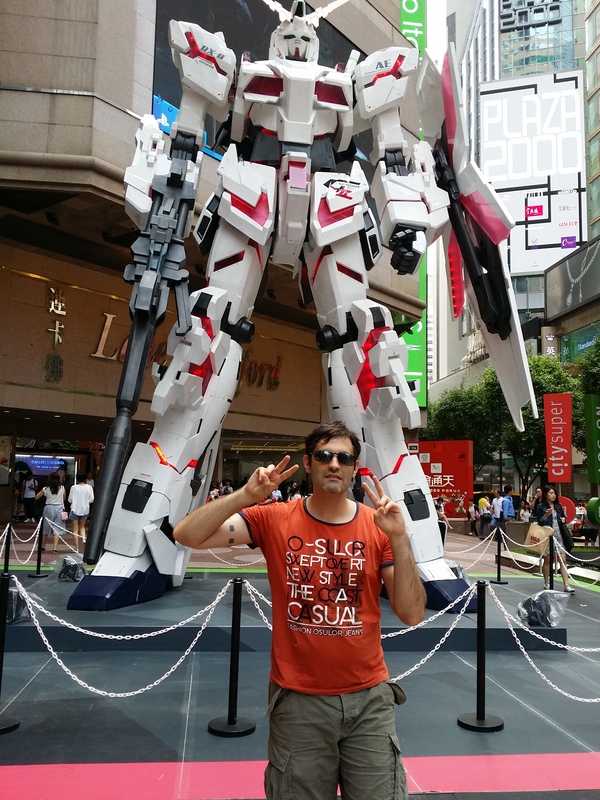 Personally I’m far more interested in the installations they set up at Times Square, Gundams! 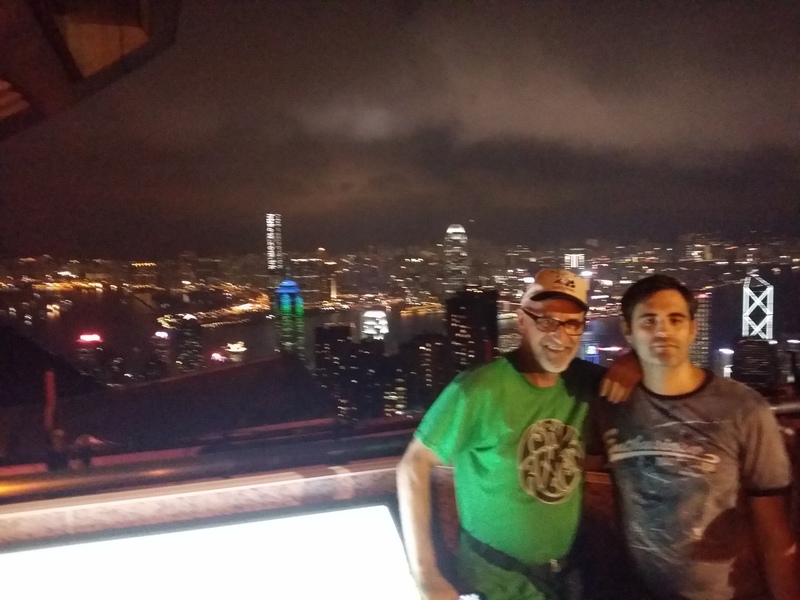 More importantly, back to regular tours, we took the tram up to Victoria Peak. Absolutely incredible at nightfall. Again, while China/Hong Kong didn’t have as much martial arts-themed sights has he’d hoped, we did find an exhibition at the Heritage Museum for our last day in Hong Kong. 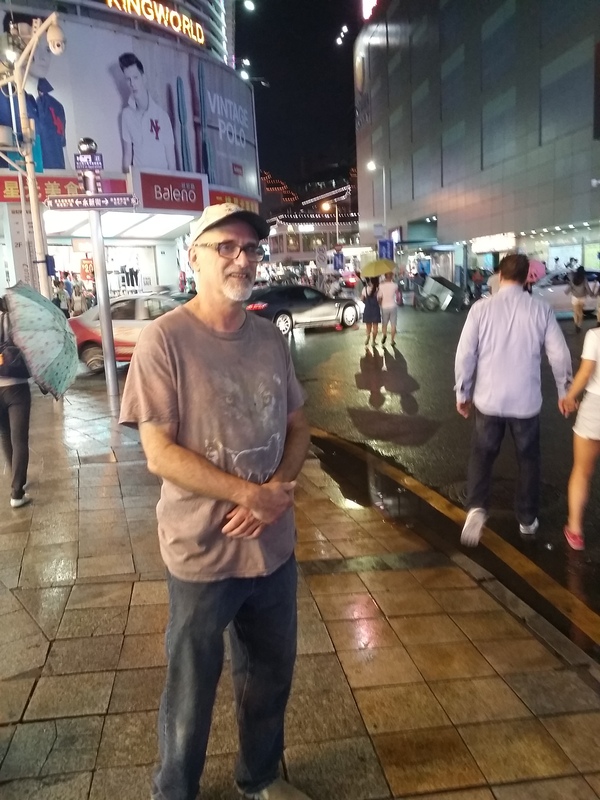 When we crossed the border into the mainland — my city of Shenzhen — I realized that on the second leg of the trip we were to take it much easier. More lazing about, less scurrying from one place to the next. I indeed wanted to do more scurrying, but what are ya’ gonna do? We did go to Dongmen wild shopping market, full of fakes and crowds, and there fully stocked on souvenirs. Not to mention more street food. Which he didn’t like. The subway station there is called Lao Jie, 老街 literally “old street”, and does contain the rare sight of an old ancient building in young Shenzhen. 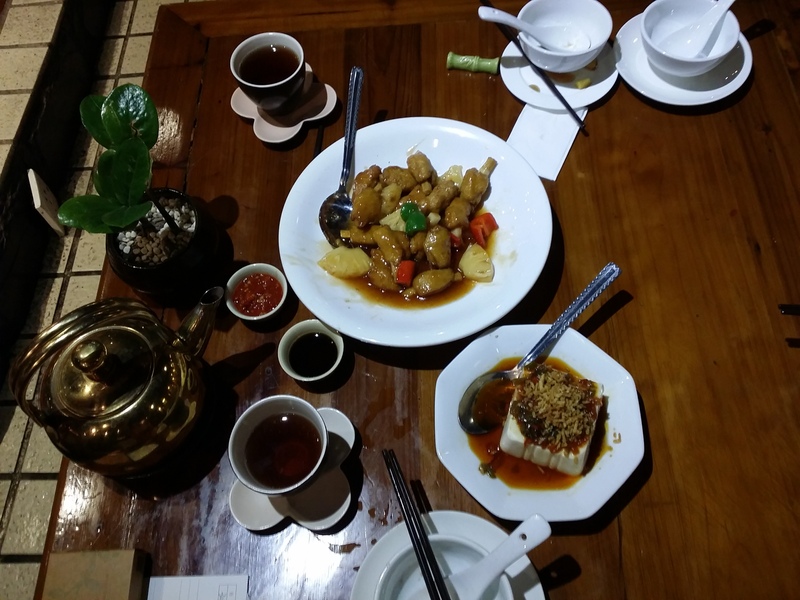 And the Buddhist section of town on Bao’an Road has those great vegetarian restaurants. Finally: food my dad wasn’t afraid to eat. Unfortunately it rained a lot, so not so many parks. No Splendid China. Only saw Window of the World from the outside. Early to rise one day we did get to see old people doing Tai Qi, one of them traditional Chinese interests, over at Yuan Bo Yuan park. 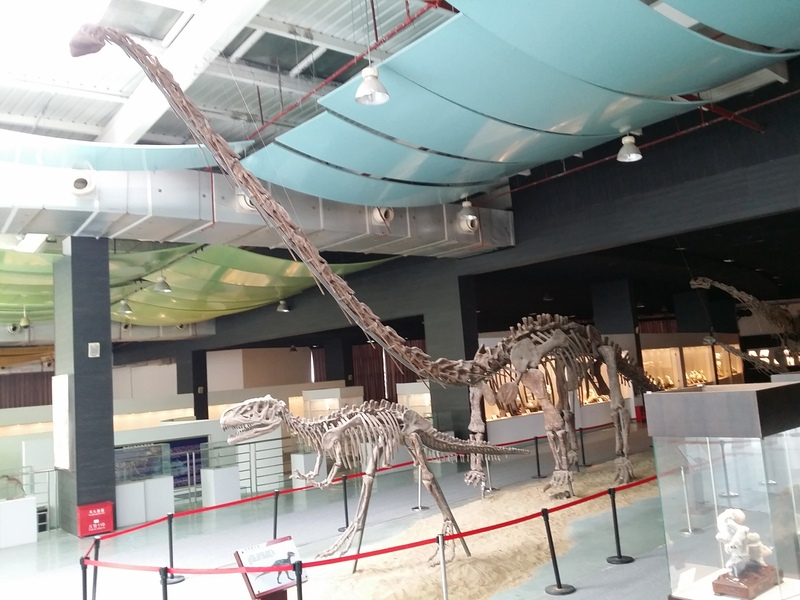 Not only that, but a small dinosaur museum there! Last day, we went out to hypermodern Coco Park mall and saw the film Monster Hunt. Not exactly a realistic martial arts romp, but fun. Capped it off with Indian food, and the trip was a success. Nothing left to do the last morning but send him off to the Hong Kong airport and wish for the best. He did make it back home to Chicago alright, by the by. It was an amazing trip. 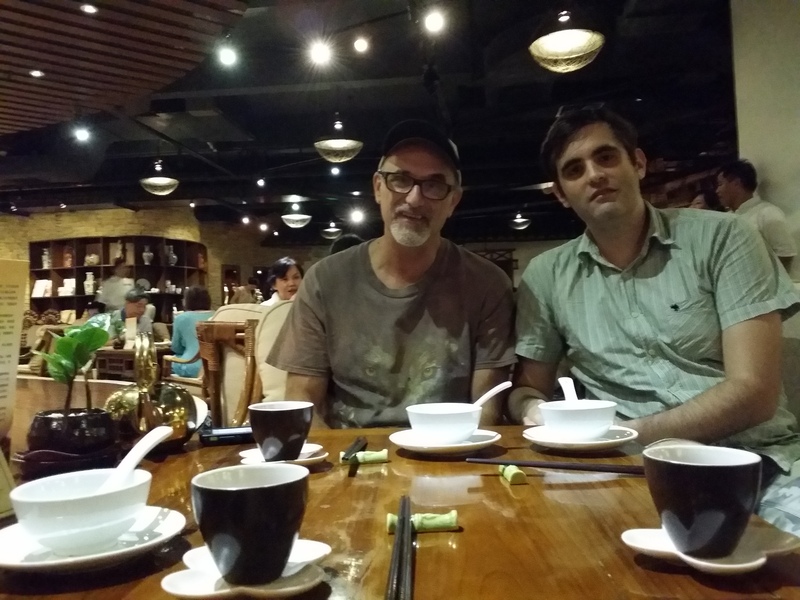 Though me and my dad have our complications, I’m so glad he was able to experience some of my life in China. 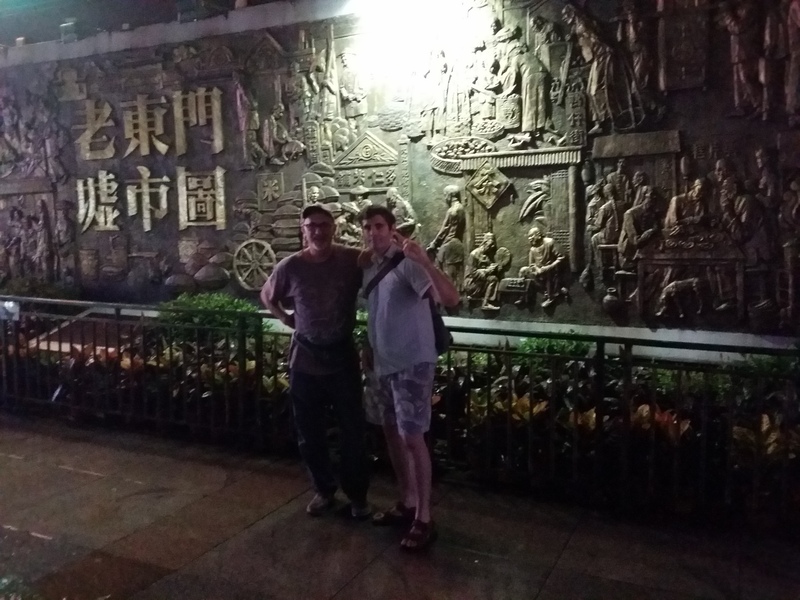 Even though we didn’t get to go to Guangzhou and see more of the traditional culture, I think he was more than happy. A Hong Kong-focused trip isn’t bad at all. Next year will be better. We have plans to go to Beijing and everything will be smoother now that he knows what to expect (and he has a visa, and no complications with figuring out how Hong Kong works with the border and all the different currencies). It will be more properly Chinese with the Great Wall and Forbidden City. Perhaps, if very lucky, we won’t drive each other crazy. 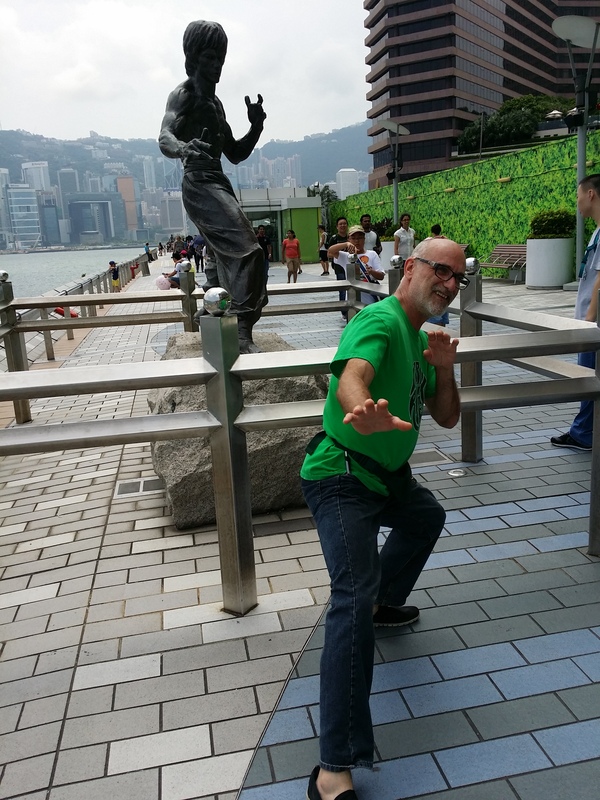 This entry was posted in Travel and tagged Bruce Lee, China, Dad, dinosaurs, gundam, hong kong, Monster Hunt, shenzhen, vegetarian by Ray. Bookmark the permalink. I suppose it is an age thing. After a certain point people are used to the food they are used to. Great write-up! Your dad look so happy in the photos and I’m all for Hong Kong, so I think it was a perfect introduction to Greater China. 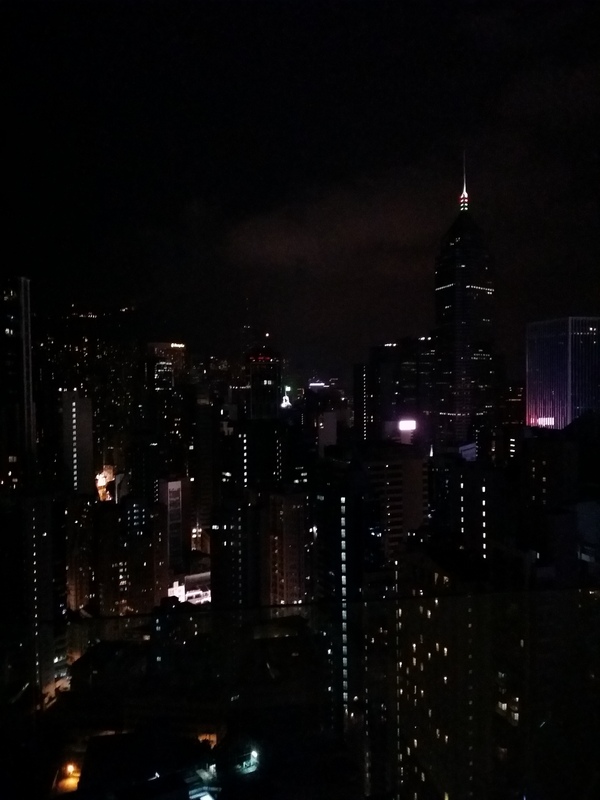 Where did you stay in Causeway Bay? It sounds very convenient and I’m always looking for a good deal. People sometimes ask me where to stay there and it’s hard because I don’t really know the hotels compared to restaurants, tourist places, etc. Dinosaurs and Gundams? All the family will want to come over next time. What a great time you and your dad enjoyed! Thanks for sharing that. I guess you will find it strange yet heart comforting when your dad visited you. I never had my parents visited me when I was in Shanghai because they were so afraid of the pollution. My sister came though and went through a huge culture shock. I’m glad I sent her home after a week of culture induction and she probably learned how to curse in Shanghainese!